The latest issue of Cuisine at Home had some great recipes for different stocks, including a vegetable version. Veggie stocks are one stock I almost never have on-hand because I so rarely use them, but a recipe I would be making called for a few cups of the stuff. Besides, we just bought ourselves a chest freezer and it’s still mostly empty! It needs some good homemade stock to help fill it up. 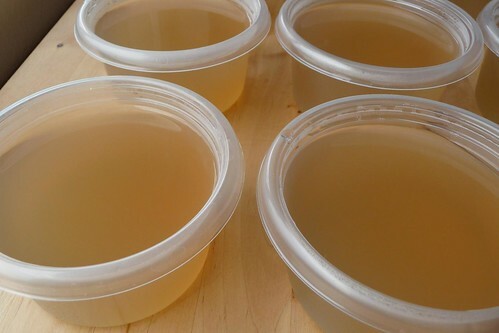 Veggie stock is a fast stock to throw together with a cooking time of no more than 2 hours (for this recipe, anyway). It will work with a multitude of combinations of different vegetables, so take my pick with a grain of salt. It freezes well, especially if you portion it into ice cube trays or 1 cup containers for easy defrosting later. I can’t believe I haven’t done this sooner! It’s strong and full of flavor. Plus I only spent about 10 minutes chopping up some veggies and about 90 minutes simmering (with only occasional checks). Now I’m seriously considering making other stocks and there was this post that I saw on veal reductions that looked seriously yummy. Winter’s coming up, after all, and having a pot of soup on the burner is never a bad thing then. 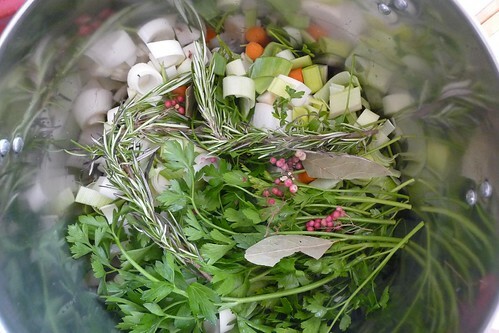 Put everything into a stockpot (at least 6 qt) and add water to cover veggies by 1 inch. Bring to a simmer and cook for 45 minutes to an hour. Skim off any impurities. 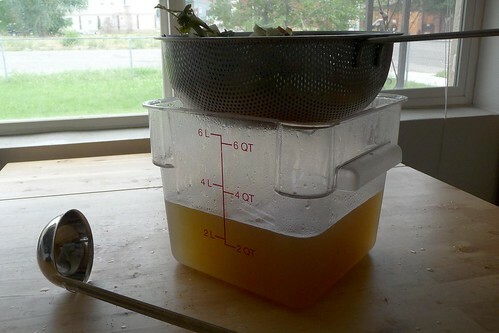 Strain stock through a large, fine-mesh sieve into a large container and discard vegetables. Cool and refrigerate or freeze. I recommend not salting the stock since it can throw off the balance of the meal you use it in. For instance, you might want to reduce a cup for a sauce which would result in an over-salted sauce. This entry was posted in dairy-free, gluten-free, recipes, soup, untranslated, vegan, vegetable, vegetarian. Bookmark the permalink.